Dimensions : 102 H x 260 W x 73.5 D cm. Original : collection of a Belgian antiquarian. 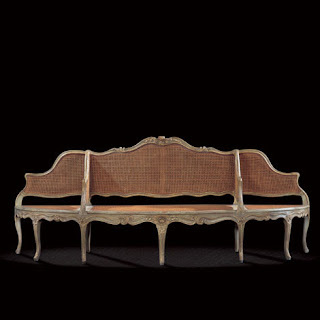 This large, deep cane Louis XV sofa with eight legs represents all the brilliance of the great cabinet makers of the middle of the 18th century in France. It is a large, movable seat, curving and counter-curving, with deep floral motif carvings. The “beading” finished in foliage that separates the moulding in the middle of the legs denotes superior quality. 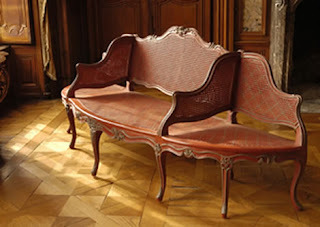 The pronounced “ridged razor-back” will also be noted, the rounded fastenings of the belts to the legs, which connect this piece of furniture to that produced by the great cabinet makers of Lyons (Pierre Nogaret, François Canot, Thomas Levet…). This style can also be seen with René Cresson and Nicolas Heurtaut.